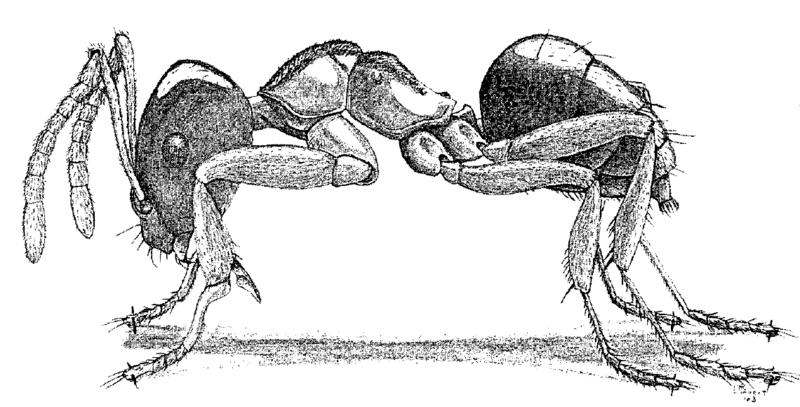 Brachymyrmex depilis - Drawing by Holly K. Coovert. The species name depilis means without hair. 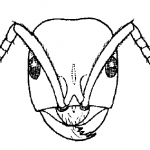 These tiny, mostly subterranean ants apparently receive most of their nutrition from honeydew-producing insects on the roots of plants and are only infrequently found above ground. It is one of the smallest ants found in Ohio. Brownish-yellow to yellowish-brown, alitrunk paler ventrally, gaster usually darker apically, antennae and legs paler; head and alitrunk moderately glossy, gaster less glossy due to thin covering of microscopic pubescence. 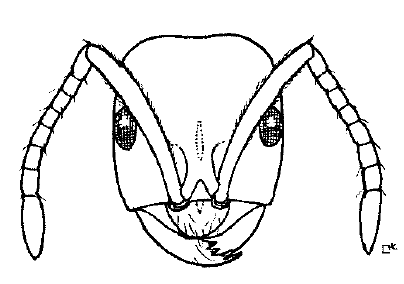 Easily recognized by the generic characters, especially the small size and 9-segmented antennae. Formerly considered a subspecies of the European B. heeri. Found in woods and woods' edges. Wesson & Wesson found that it "seems to be most abundant in open woods, but we have also taken it in rotten logs in dense moist woods, and in meadows and dry fields." 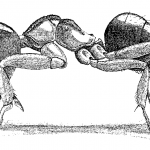 Workers found foraging on foliage and at the bait, demonstrating that they are not completely subterranean. In soil under rocks, in rotten wood, hickory nut (GAC 1795). The nests "do not go more than one or two inches down into the ground under the stones"